The vision is to realise a process for optimal use of the seasonal solar energy supply and available biomass resources to satisfy the seasonal demand for heat and power, and to simultaneously produce low-GHG fuels for the transport sector. 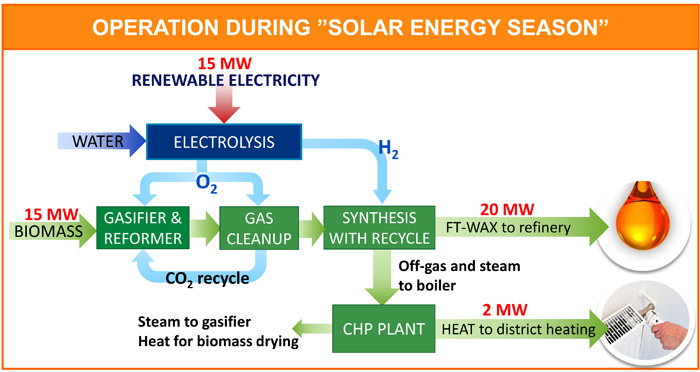 A hybrid process that integrates electrolysis to biomass gasification and synthesis is developed and the key enabling technologies of this process are validated to reach TRL5. In summer season renewable fuel intermediate (FT-wax) is produced from biomass carbon boosted with solar energy driven electrolysis. 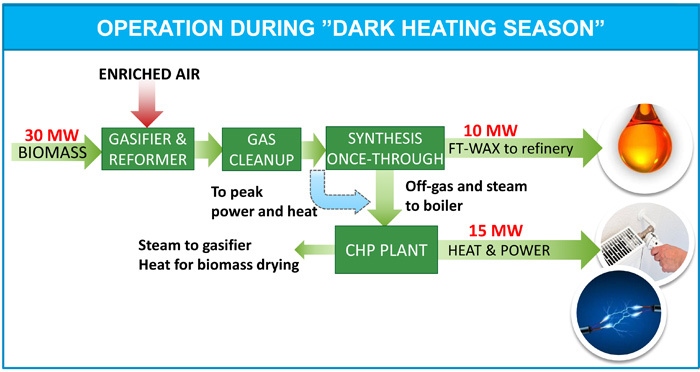 A small amount of by-product heat is also produced to cover the summer-time demand for district heating. Biomass consumption is halved compared to the wintertime operation and 50% of the input energy comes from low-cost excess electricity. In winter season the plant is operated without the electrolyzer in a way that biomass conversion to liquid fuel intermediate, heat and electricity is maximized. Most of the invested plant components are in full use throughout the year, only the electrolysis unit is operated seasonally. News-page updated. Workshop presentations added. This project has received funding from the European Union’s Horizon 2020 research and innovation Programme under Grant Agreement No 763919.